Billable Rates is a Starter plan feature. The rates are bound to time entry duration allowing you to see how much you earned for each particular job. The system will always apply the most granular rate. If a project user creates a time entry and there is a billable rate set for that user in the same project - the project user rate will be applied. Billable rates can't be defined for a specific time entry. The overall Workspace Billable Rate and currency can be set on your Workspace Settings page. 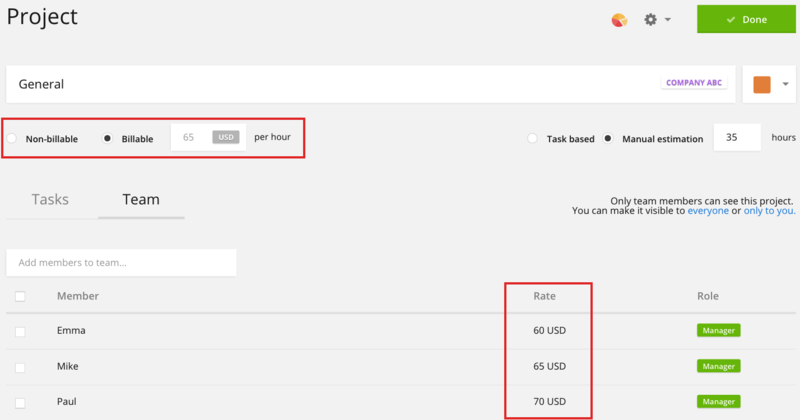 On Workspace Settings page you can also determine who can see Billable Rates – everyone or only admins. Billable Rate and currency can only be edited by the Workspace administrator. Rate can be specified from the Team page. Workspace overall currency applies to the Team Member Rate as well. If you’re on Premium or Enterprise plan, you can also insert Labour Cost. Project rates are accessible via Projects Edit page. Project-specific Billable Rates can be specified within each project separately. Type in project’s hourly rate and/or a team member specific hourly rate. Workspace overall currency applies to the Project Rate as well. However, by clicking on the gray currency badge you can set a unique currency per project. Billable totals, amounts and charts will be consistently displayed in Reports. For example, here's a screenshot from a typical Summary report. If you're unsure which rate is being applied to a time entry, turn on the "Distinct rates" view in Summary reports. It's available through the cogwheel menu button. Workspace administrators are able to see and edit every team member’s hourly rate. Project managers are able to see and edit those team members’ hourly rates who belong to the project that they are managing. Regular users are not able to see or edit any team member’s hourly rates that have been set in that workspace.